Xacuti Potato Stuffed Paratha is a fusion paratha made with aloo spiced with Goan Special Xacuti Masala Powder. This paratha makes a wonderful meal anytime. When I came to pick up X, I suddenly remembered that I had Xacuti from Goan to make forever! So I thought it was a wonderful try with making these parathas with Xacuti Curry Masala. I checked if somebody has already done it and couldn’t come up with any results. So I thought Mega BM really pushes to think beyond our regular thoughts. I was really glad that I thought of this dish and not resort to some vague usage of X. I made the special Xacuti Masala Powder for this and made this for our dinner. It’s so surprising how we have almost reached the last few days and we have managed to blog nonstop even though I began very late. 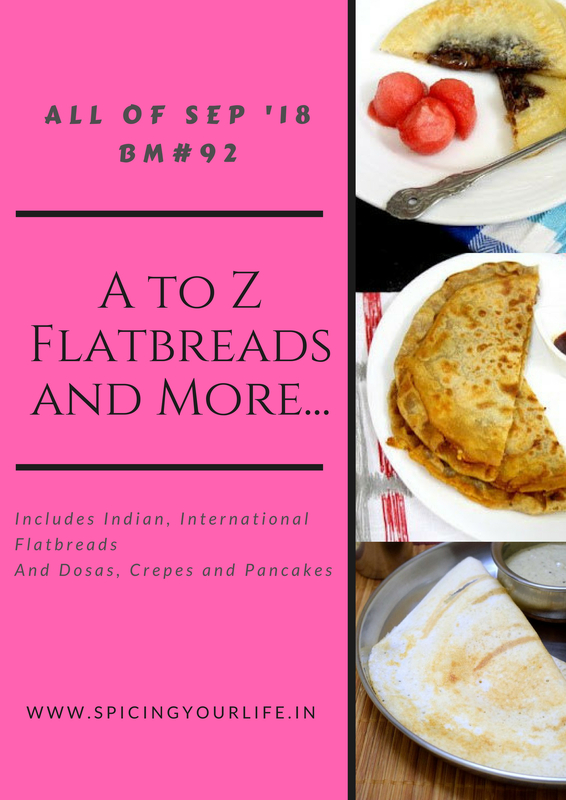 X is a fusion of Goan Xacuti as Stuffed parathas in the AtoZ Flatbread and More, where I am doing AtoZ Indian Flatbread. If you are curious to know what’s X in the AtoZ Dosa Varieties, do check it out. Take the flour and salt in a bowl, knead to a soft dough using just enough water. Let it rest for 30 mins. Wash and slash the potatoes. Microwave for 6 mins. Soak in water and peel the skin. Heat a nonstick pan and saute onions in oil. Add the mashed potatoes along with chili powder and green chilies. Mix well and cook for 5 mins. Then add the xacuti powder. Combine everything. Finally, add finely chopped coriander leaves. Dust and flatten on the sides. Place a spoonful of stuffing in the center and seal it well. Flatten and dust it well with flour. Roll out to a thin roti of 6 inch disc. Cook the paratha on both sides with oil. Serve with pickle and curds. Xacuti Masala Powder has a long shelf life and can be preserved in refrigerated. Xacuti is such a flavorful spice mix and that paratha would have tasted awesome with the combination of xacuti and potatoes. Looks so delicious and tempting!! Thats a brilliant idea to make Xacuti spiced potatoes to stuff. Xacuti potato stuffed paratha tempts me a lot. Such a flavourful and interesting paratha to give a try without any fail. You have very smartly picked the same xacuti masala and used it for dosa and paratha. Hats off to your creative thinking. This looks awesome. I guess I tried xacuti for a previous BM long term back. And the remaining spice powder went into every recipe I made until it got finished. Though it was so good, I didn’t repeat it as we all do. Using it in the aloo masala and using that for the paratha is a brilliant idea Valli. I had xacuti in mind for X but had enough of spicy flatbreads. I wish I had spaced them more. Adding the xacuti spice to the filling makes it taste so different from the normal spices I use for aloo paratha. A well thought out recipe. Looks like a yummy and a flavourful paratha. Good find for the letter X, was not aware of such masala. Such an innovative recipe Srivalli! The xacuti masala is so flavorful and the parathas would have tasted amazing! I am planning to make this xacuti curry powder. looks so versatile to make many more dishes. loving this xacuti potato paratha. The Xacuti curry powder is something that I have not tried yet. Hopefully will save it for the next mega marathon alphabet. This is a very innovative recipe with the curry powder and that should have been so flavorful.